2 Welcome to 5 th Grade! 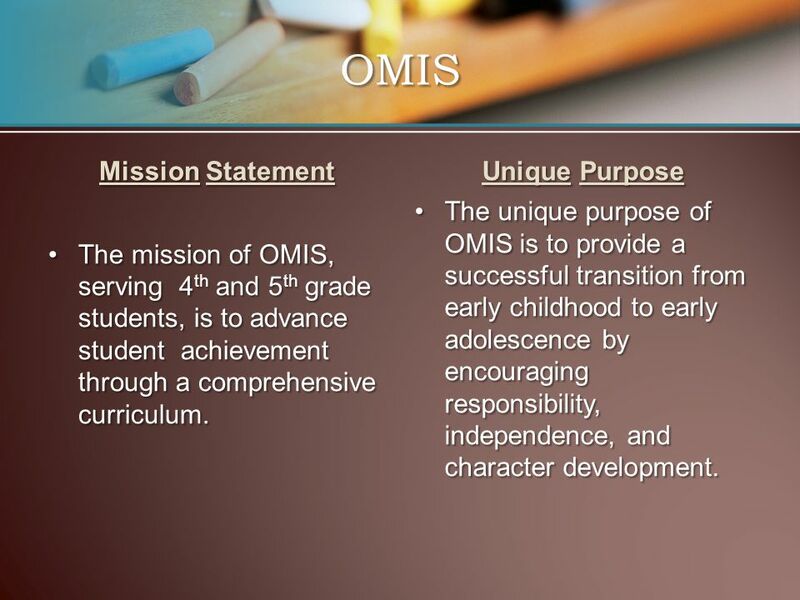 We see your child’s educational experience as a partnership between student, teacher, and parent. Communication between all parties is essential to making this partnership successful. 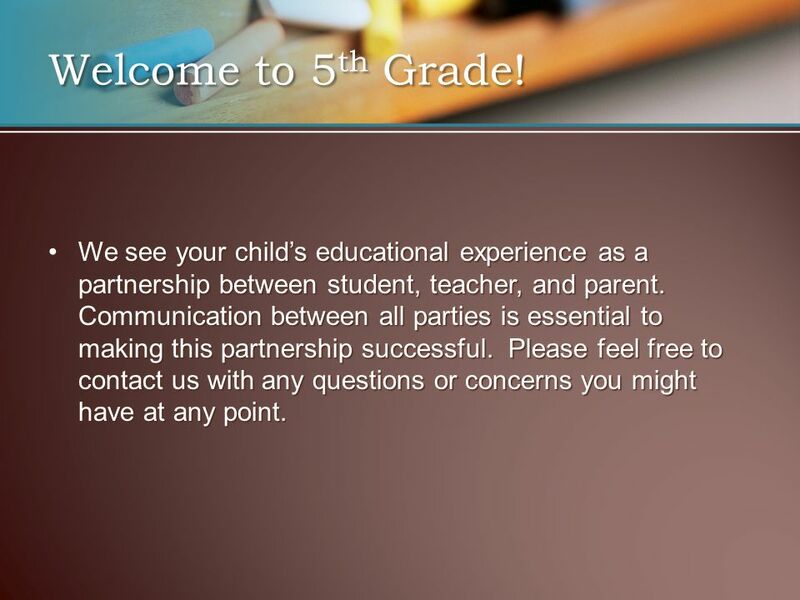 Please feel free to contact us with any questions or concerns you might have at any point.We see your child’s educational experience as a partnership between student, teacher, and parent. Communication between all parties is essential to making this partnership successful. 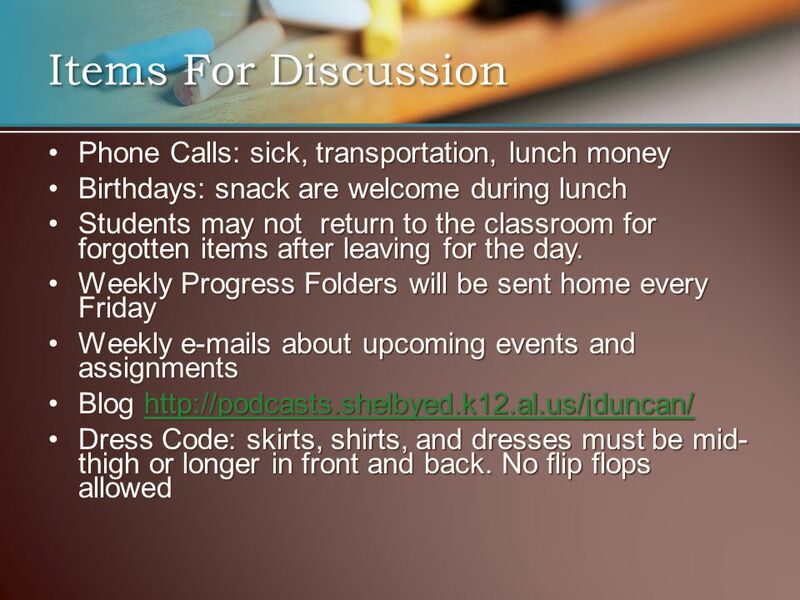 Please feel free to contact us with any questions or concerns you might have at any point. 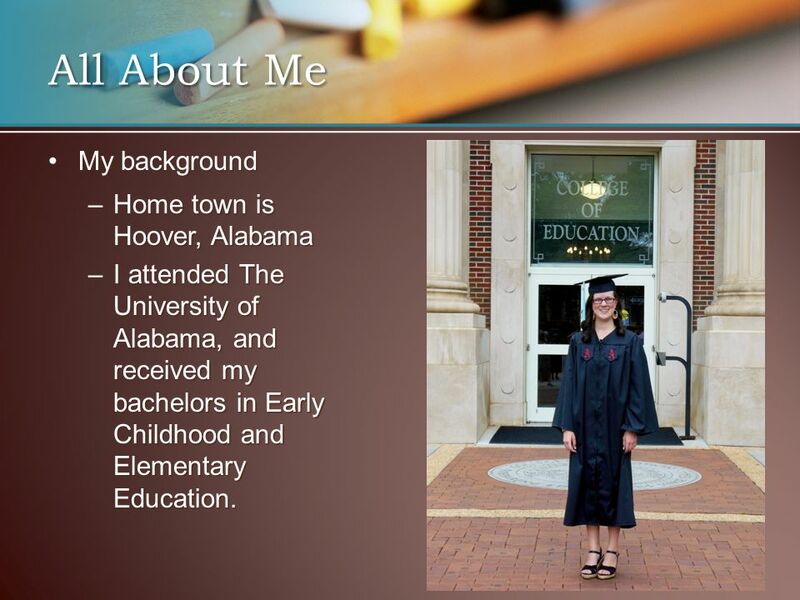 5 All About Me My backgroundMy background –Home town is Hoover, Alabama –I attended The University of Alabama, and received my bachelors in Early Childhood and Elementary Education. 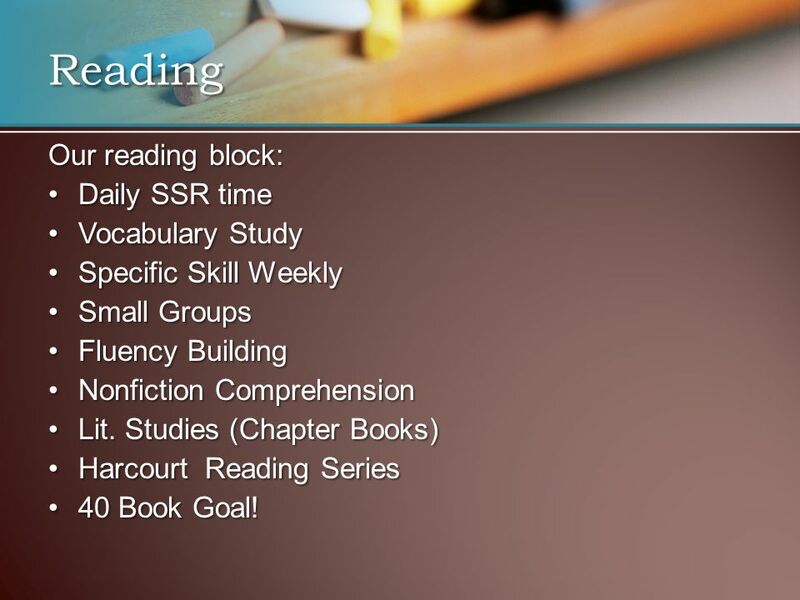 13 Reading Our reading block: Daily SSR timeDaily SSR time Vocabulary StudyVocabulary Study Specific Skill WeeklySpecific Skill Weekly Small GroupsSmall Groups Fluency BuildingFluency Building Nonfiction ComprehensionNonfiction Comprehension Lit. Studies (Chapter Books)Lit. Studies (Chapter Books) Harcourt Reading SeriesHarcourt Reading Series 40 Book Goal!40 Book Goal! 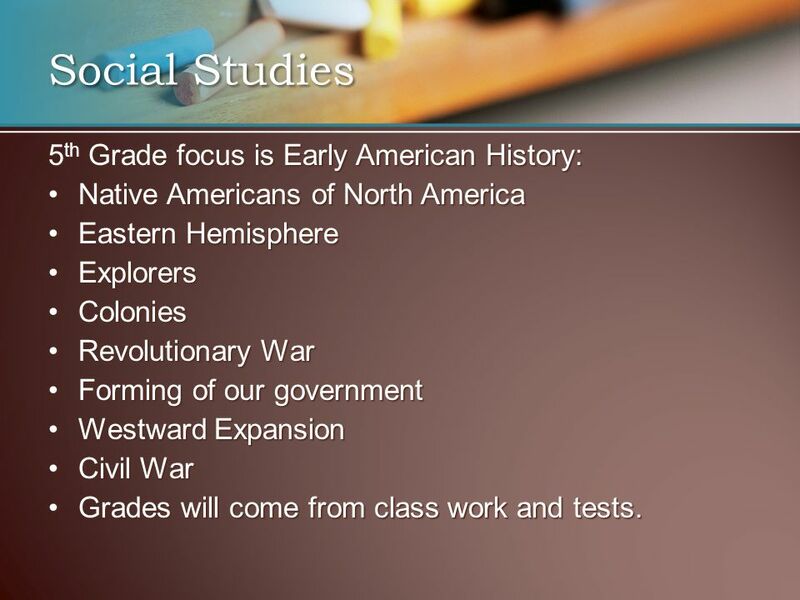 18 Social Studies 5 th Grade focus is Early American History: Native Americans of North AmericaNative Americans of North America Eastern HemisphereEastern Hemisphere ExplorersExplorers ColoniesColonies Revolutionary WarRevolutionary War Forming of our governmentForming of our government Westward ExpansionWestward Expansion Civil WarCivil War Grades will come from class work and tests.Grades will come from class work and tests. 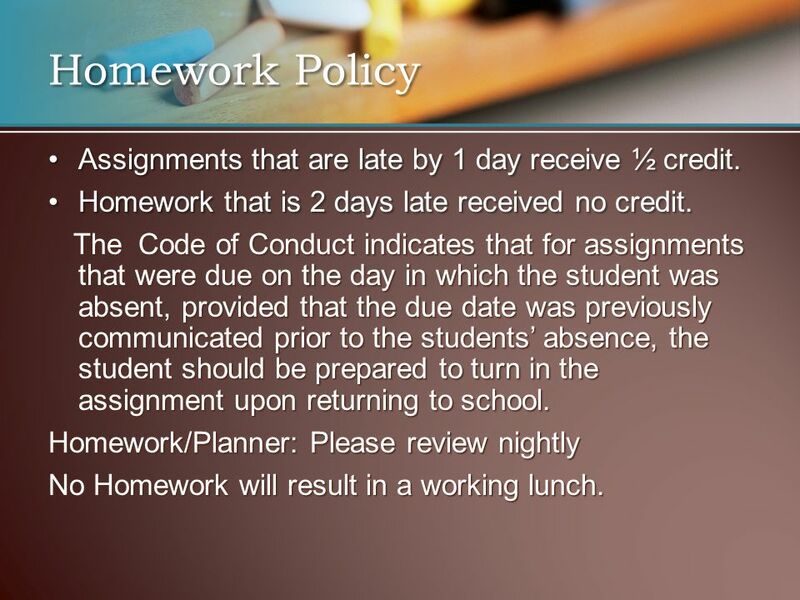 19 Homework We will assign about 45-60 minutes of homework every night. This includes 120 minutes of reading each week. 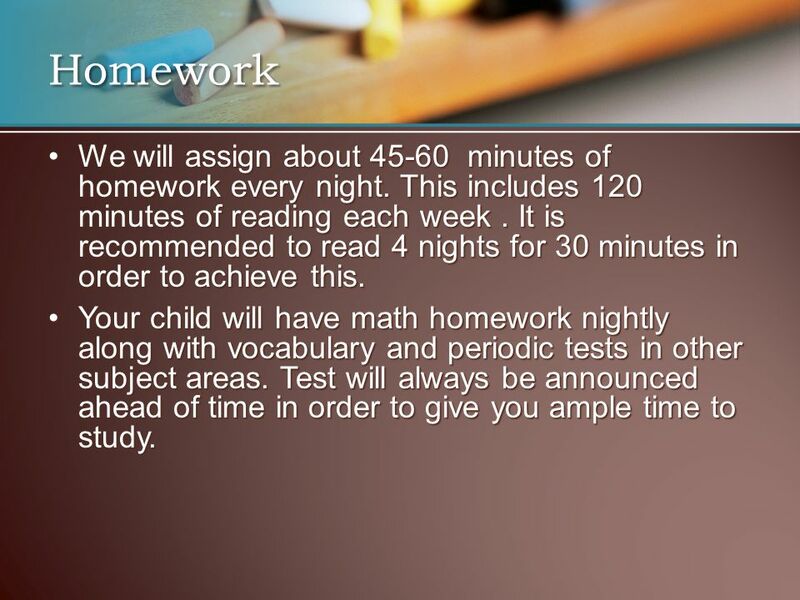 It is recommended to read 4 nights for 30 minutes in order to achieve this.We will assign about 45-60 minutes of homework every night. This includes 120 minutes of reading each week. It is recommended to read 4 nights for 30 minutes in order to achieve this. 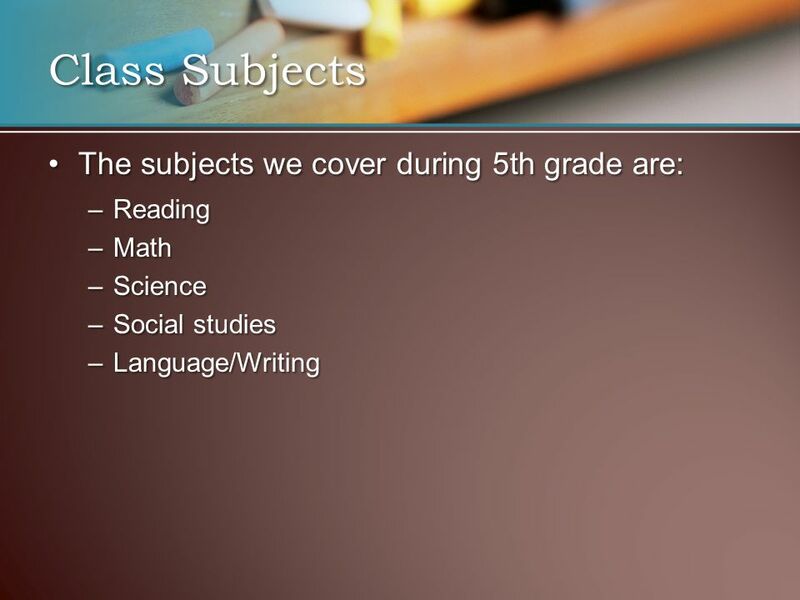 Your child will have math homework nightly along with vocabulary and periodic tests in other subject areas. 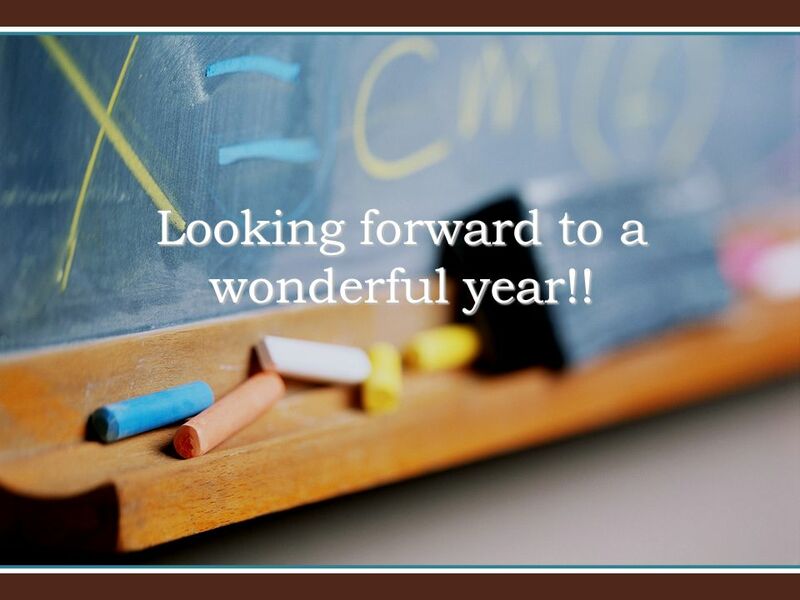 Test will always be announced ahead of time in order to give you ample time to study.Your child will have math homework nightly along with vocabulary and periodic tests in other subject areas. Test will always be announced ahead of time in order to give you ample time to study. 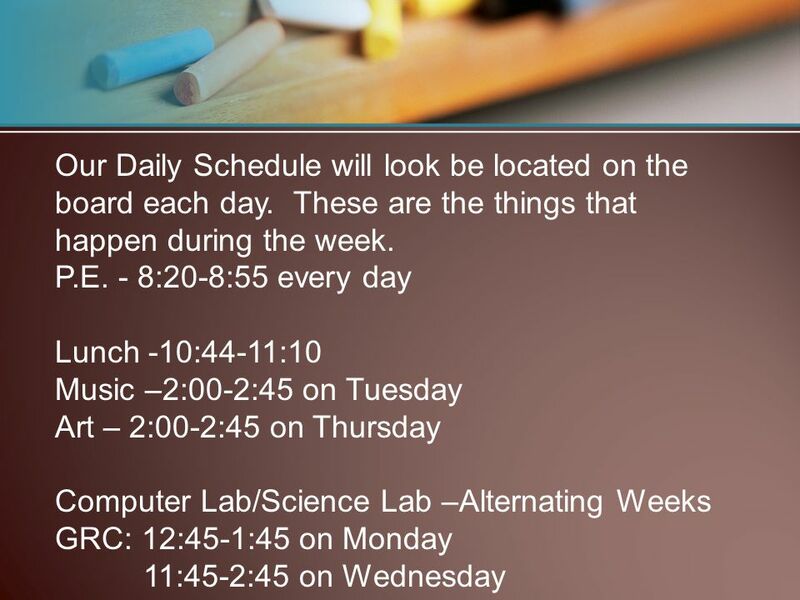 21 Tardiness/Absence School starts at 7:50 a.m.-your child will be tardy if not in the classroom when the bell rings.School starts at 7:50 a.m.-your child will be tardy if not in the classroom when the bell rings. When you r child is absent, they will have a list of missed work on their desk when they return. 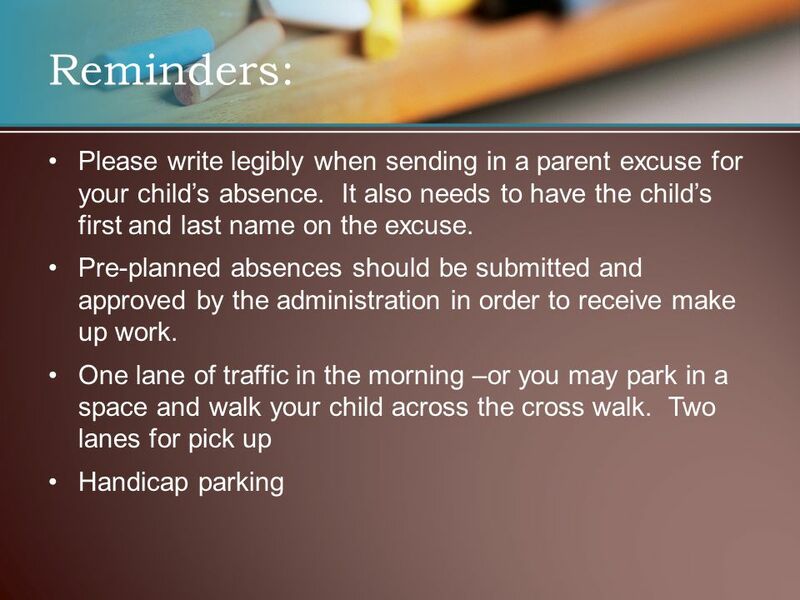 It is their responsibility to complete that work and ask questions or for help if needed.When you r child is absent, they will have a list of missed work on their desk when they return. It is their responsibility to complete that work and ask questions or for help if needed. Be sure to send an excuse from home or doctor upon returning to school.Be sure to send an excuse from home or doctor upon returning to school. 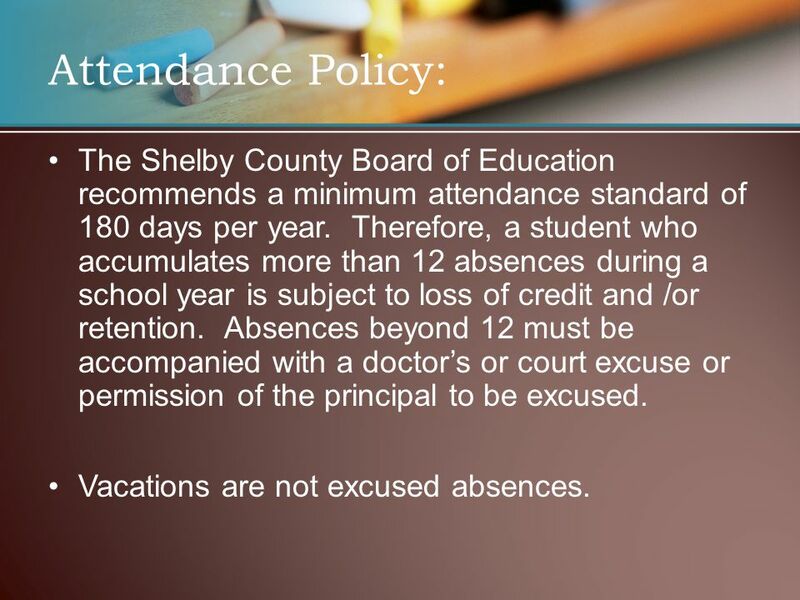 22 Attendance Policy: The Shelby County Board of Education recommends a minimum attendance standard of 180 days per year. Therefore, a student who accumulates more than 12 absences during a school year is subject to loss of credit and /or retention. 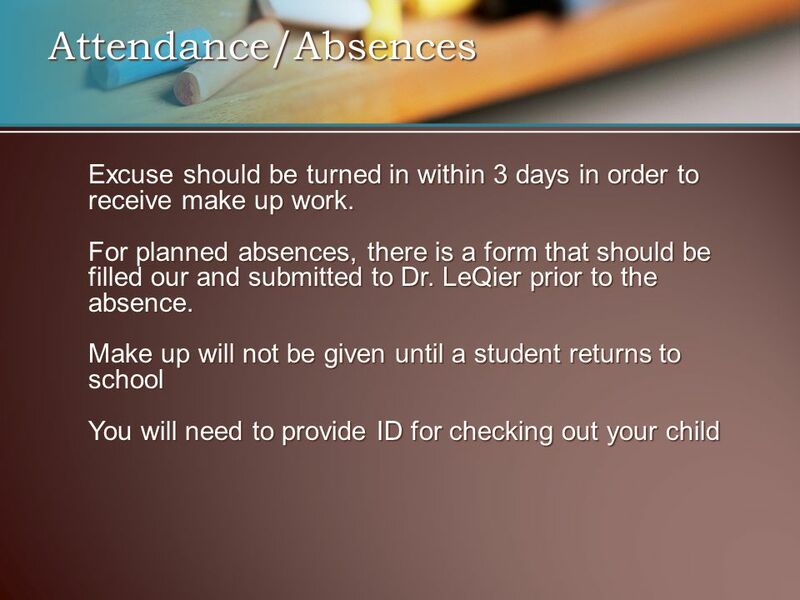 Absences beyond 12 must be accompanied with a doctor’s or court excuse or permission of the principal to be excused. Vacations are not excused absences. 23 Field Trips We have lots of fun field trips planned for this year!We have lots of fun field trips planned for this year! 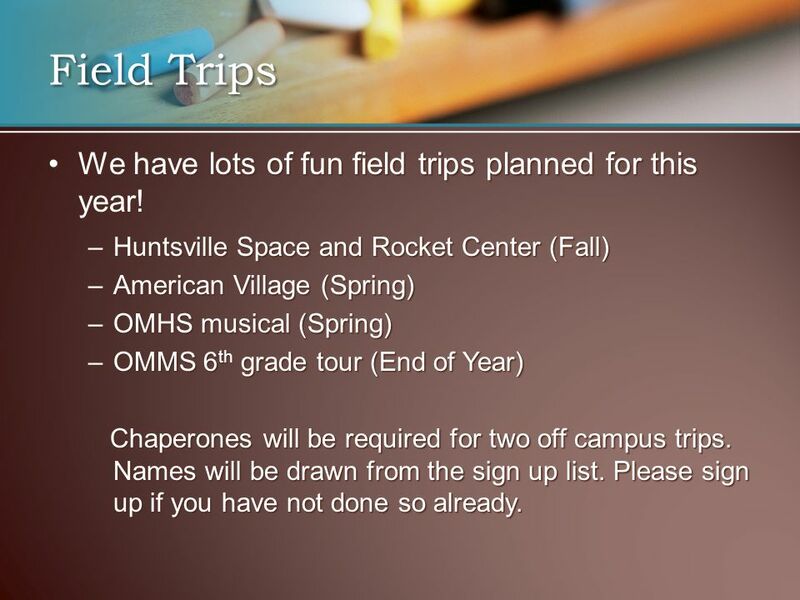 –Huntsville Space and Rocket Center (Fall) –American Village (Spring) –OMHS musical (Spring) –OMMS 6 th grade tour (End of Year) Chaperones will be required for two off campus trips. Names will be drawn from the sign up list. Please sign up if you have not done so already. 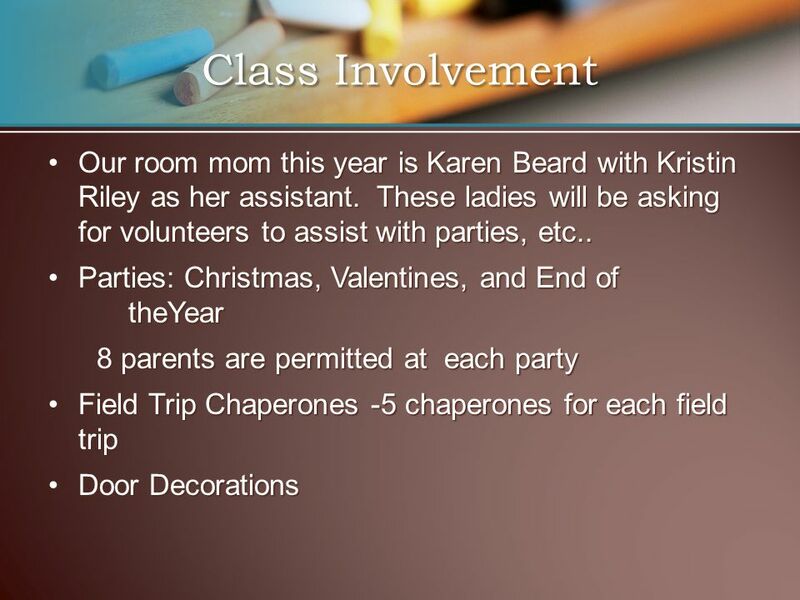 Chaperones will be required for two off campus trips. Names will be drawn from the sign up list. Please sign up if you have not done so already. 26 Sign all forms and leave them on your child’s desk.Sign all forms and leave them on your child’s desk. Take the information packet and the Code of Conduct home for your reference.Take the information packet and the Code of Conduct home for your reference. Write your Who Am I? 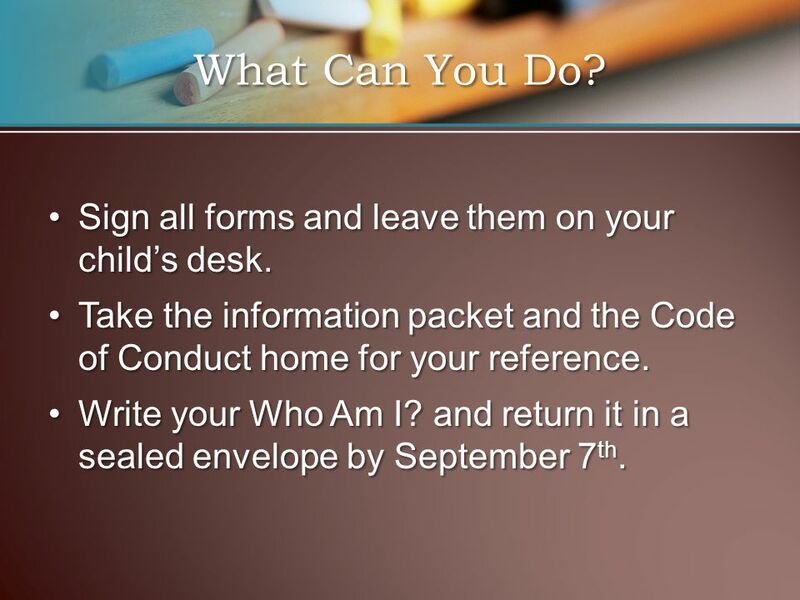 and return it in a sealed envelope by September 7 th.Write your Who Am I? and return it in a sealed envelope by September 7 th. What Can You Do? 27 Looking forward to a wonderful year!! 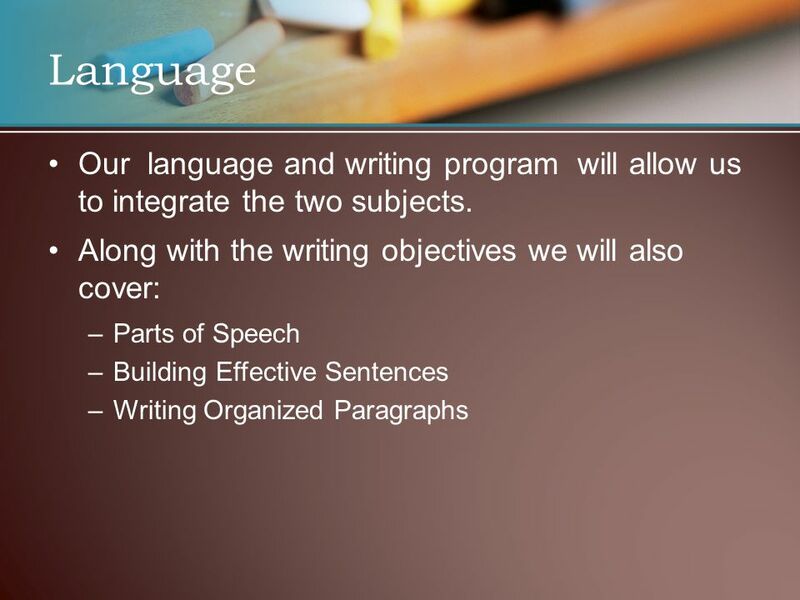 Download ppt "Welcome Parents! Ms. Duncan's 5 th Grade. Welcome to 5 th Grade! 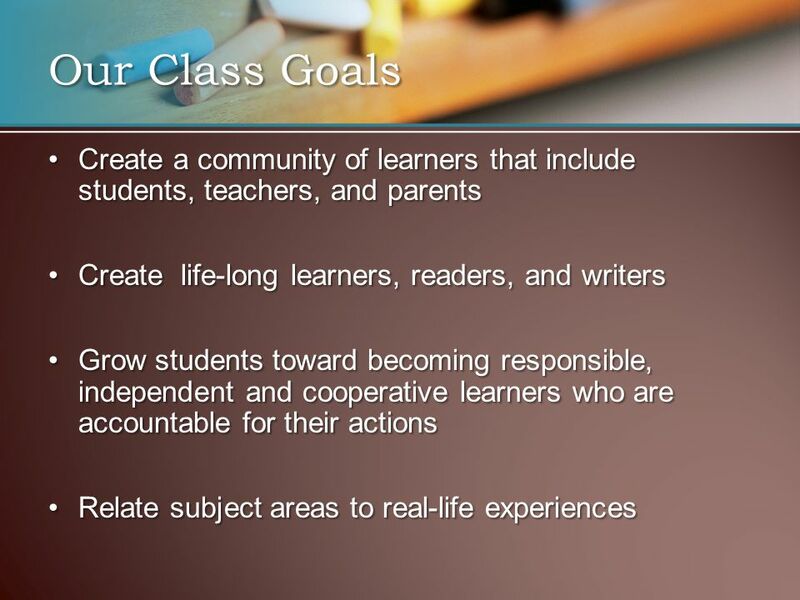 We see your child’s educational experience as a partnership between student, teacher,"
First Grade. Our Daily Schedule 7:50-8:00 Arrival 8:00-9:30 Reading 9:30-10:00 Letterland 10:00-10:45 Specials 10:45-11:30 Remediation/Enrichment 11:35-12:00. Welcome to Parent Night Amy delaTorres Classroom Information. 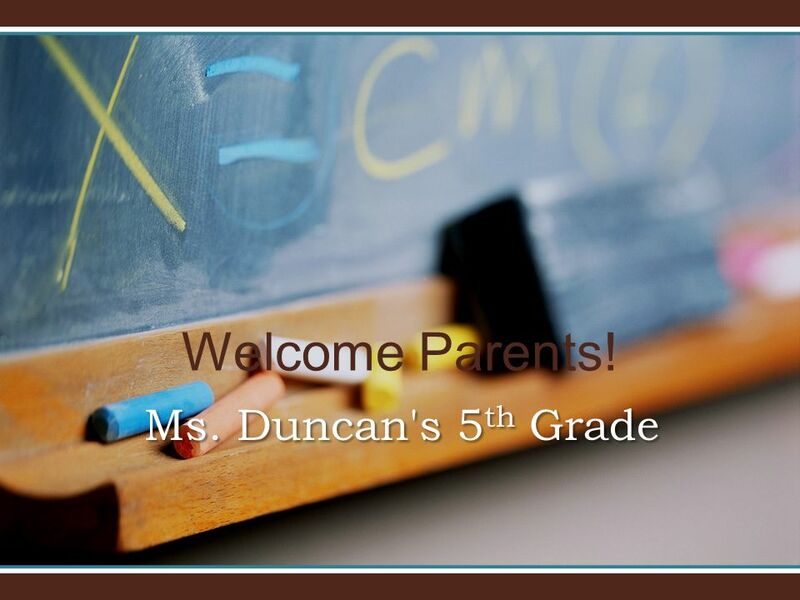 Welcome parents and students to the third grade year. We always look forward to each year with anticipation and excitement. We hope that the. Welcome to 2nd Grade Mrs. Hobbs’ Class. 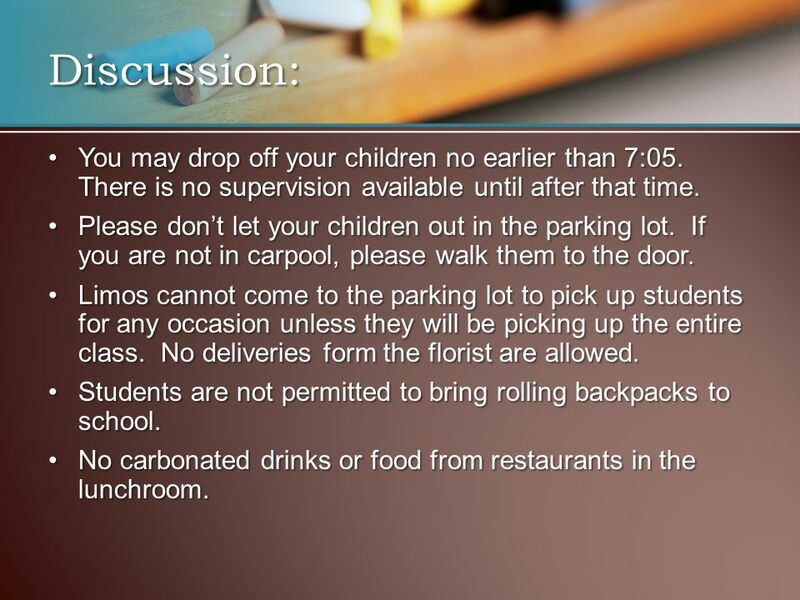  My homeroom comes in each morning at 7:30 a.m. and unpacks their things immediately. They may talk quietly as they unpack until the bell. Welcome to 5 th Grade! Communication between all parties is essential to making the partnership between student, teacher, and parent successful.Communication. Mrs. Lewis’ Class School Year. 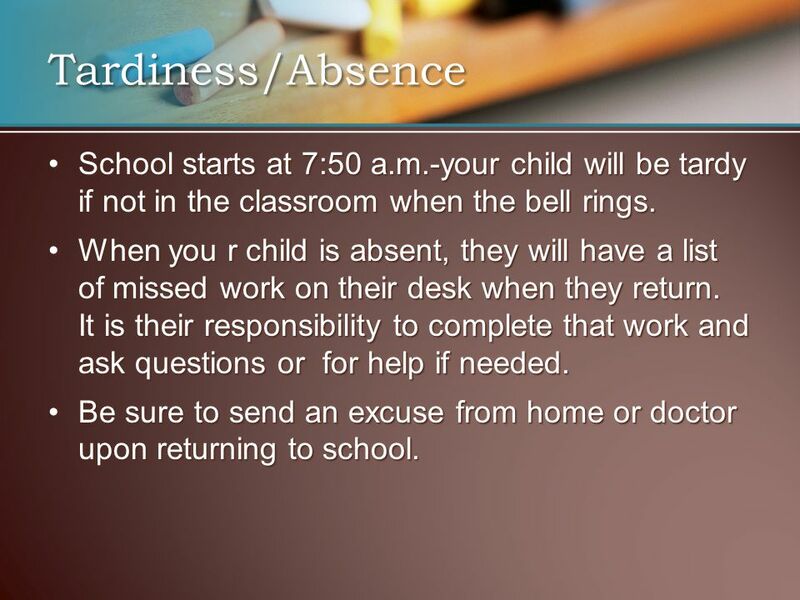 The ABC’S of our classroom : A ttendance- If your child is absent, they must bring a written excuse upon returning. Prospect Elementary Open House Mrs. Decker Grade 5. Welcome Parents! 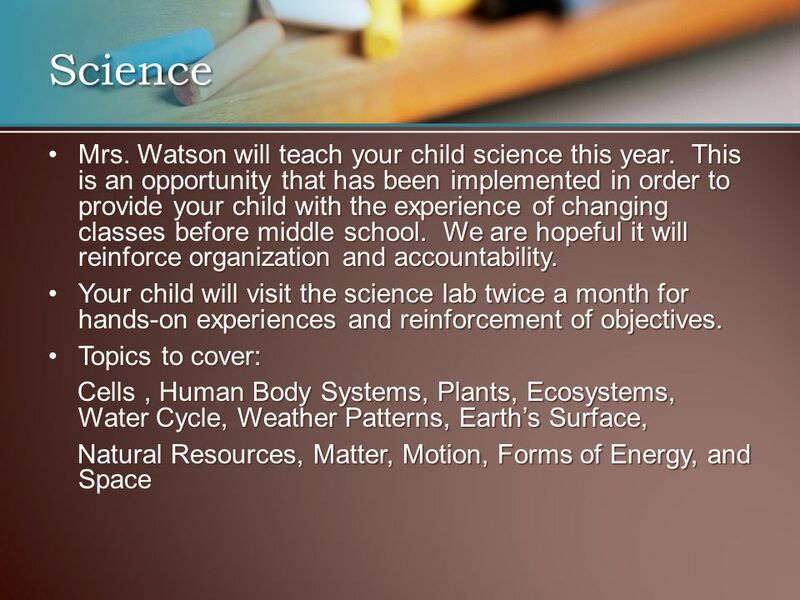 Mrs. Watson's 5 th Grade. 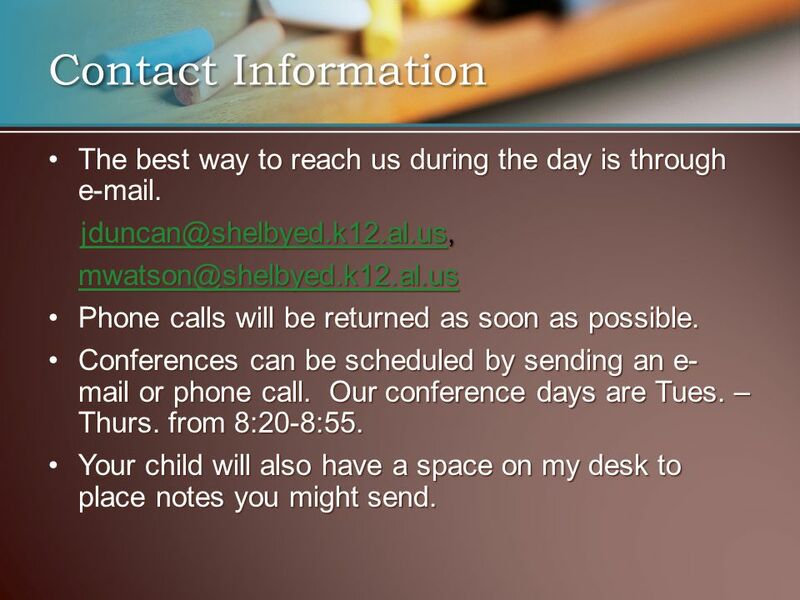 The best way to reach us during the day is through e- mail.The best way to reach us during the day is through. Welcome! On your child’s desk, you will find a letter that they wrote to you this afternoon. Please read the letter and write them back if you wish. Inside. 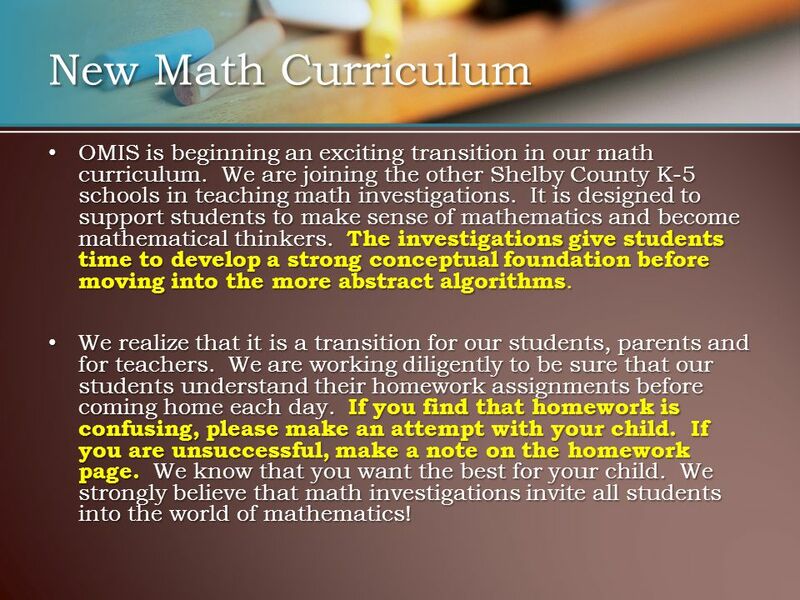 Welcome to Parent Curriculum Night rd Grade Lakeway Elementary **If you have any questions throughout the presentation, please write it down on.